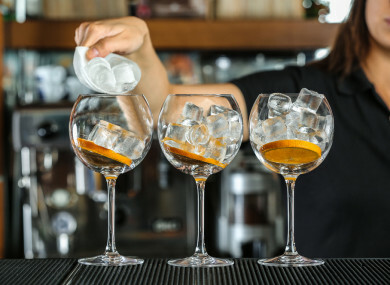 TWO OUT OF three pubs in Dublin expect to see their business grow in 2019 as the gin and craft beer trend continues. Almost half of Dublin pubs (48%) are expecting growth in the region of 1–10%, 18% forecast growth of 11–24%, and 2% are anticipating an increase in business of 25% or more. The figures are included in a report, The State of the Dublin Pub Trade 2019, published by the Licensed Vintners Association (LVA) ahead of the group’s AGM tomorrow. While the majority of Dublin pubs expect to see an increase in business, 21% believe things will stay the same this year, 10% are forecasting a 1–10% drop, and 1% think their business will decline by 11–24%. Despite the positive outlook, many publicans are worried about the impact Brexit could have on tourism as well as the VAT rate in the hospitality sector increasing from 9% to 13.5% in January. The LVA said the situation in Dublin pubs is “in contrast to the uncertainty experienced by hospitality and tourism businesses based outside the capital, with difficult trading conditions being widely reported”. A spokesperson for the organisation added that the survey data highlights “a growing ‘two-tier’ outlook in the tourism and hospitality industries between Dublin and the rest of the country”. The research also found that the average Dublin pub expects to hire an additional five staff members this year, two in full-time roles and three in part-time positions. This adds to the current 12 full-time staff members and 15 part-time members of staff employed on average in pubs across the capital. Providing food has also become an increased area of focus within the Dublin trade and that trend looks set to continue in 2019, with 60% of pubs expecting to see their food business grow. Four out of 10 Dublin pubs expect to be refurbished this year, with one in eight planning to spend more than €100,000. Despite the positive outlook, the LVA said pubs are facing challenges such as Brexit, staffing issues, the cost of insurance, and competition. Pubs in the capital faced an average insurance cost increase of 50% over the last three years. The average insurance premium for Dublin pubs is now €25,000 per year. More than half of the pubs across Dublin also suspect they have been the victims of a fraudulent claim within the last five years, according to the survey. Competition from other pubs, restaurants, hotels, cafés, trips abroad and other hospitality/tourism businesses were also highlighted as a concern. Six out of 10 Dublin pubs host live music in their establishments, while only one in 20 does not feature any kind of music, according to the report. The growth of the gin trend is also reflected across the capital, with half of Dublin pubs now stocking more than 10 different types of gin. Craft beer is also becoming increasingly common in bars across Dublin, with 40% of pubs now serving six types or more. Speaking about the survey, Donal O’Keeffe, Chief Executive of the LVA said the survey’s findings “seem to confirm the growing discrepancy throughout the tourism and hospitality sector, with a two-tier system developing”. Tourism and hospitality businesses in Dublin are thriving, while widespread reports would suggest the conditions in other parts of the country are more difficult for all businesses in this sector. O’Keeffe stated that the majority of publicans are “worried about Brexit and what impact that will have on the tourism trade”. “The decision to hike the hospitality VAT rate is deeply worrying in terms our tourism competitiveness,” he added. Email “Most Dublin pubs expect to grow in 2019 as gin trend continues, but they're worried about Brexit ”. Feedback on “Most Dublin pubs expect to grow in 2019 as gin trend continues, but they're worried about Brexit ”.